Eventually, robotic technology — once it becomes cheap enough, of course — won’t just take the jobs of well-paid union workers who clock-in at air-conditioned manufacturing centers, but also the far more painful work of the thousands who spend their lives in sweatshops. And while putting thousands of people who work in textiles and electronics factories out of a job presents a whole new set of problems, human rights abuses perpetuated by large corporations operating with little to no government regulation will cease to be among them. Enter a recent innovation in robotic hands (crucial for grasping work) from researchers at UC Berkeley, which could enable machines to take on a wide variety of jobs performed by humans today. The “DexNet 2.0” robot grasping system represents a leap forward in artificial intelligence and robotics. Just how good are the robot’s hands? Well, after viewing the object in 3D, DexNet actually predicts its own likelihood of successfully picking up each irregularly shaped object before it tries, and the Berkeley researchers report that when it claimed to have a greater than 50 percent chance of success it actually succeeded more than 98 percent of the time. Interestingly, when it could not figure out a way to grab an object, the robot poked it to change its orientation, hopefully exposing a better angle. Post-poke, it was able to successfully grasp and shake objects about 99 percent of the time. What’s most impressive about DexNet’s understanding of objects is that it is generalizable, meaning that it is learning how to grab objects, not how to grab certain objects. Each time it successfully analyzes an all-new shape and picks it up, it gets a bit better at picking up the next shape even if that shape is entirely new as well. Why aren’t sweatshops already staffed by robots? 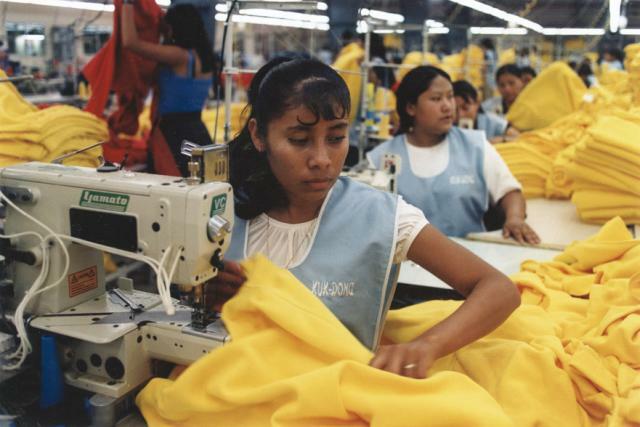 The goal of a sweatshop is obviously to produce goods as cheaply as possible, so why don’t sweatshop owners reduce the cost of paying salaries, importing goods for sale, and dealing with bad PR to almost zero? The answer is, they can’t. There have been very promising efforts to design robots specifically to phase out super-low-wage labor like clothes manufacturing, but these robots all tend to require a specially manicured environment in which to work. With human hands, you can rip open a box of fabric, fish around inside it for just a single layer of material, and pull it out without disturbing the rest. You can easily deal with simple irregularities in how the warehouse packs the fabric into the box. You can even untangle a knot. Modern robots can already handle all the core jobs of sewing a t-shirt, but each of those jobs is separated by a host of little connective tasks. If robots are incapable of even a small proportion of these tasks, they could require so much human supervision or process modification that they wipe out their own profit advantage. With sufficiently dexterous graspers, and a good knowledge of how to use them, a robot might be released into a work space and trusted to deal with all aspects of the job, and even handle problems as they come. Make no mistake: robots are coming for the modern job market. If you have the option to do so, research shows that the best way to protect yourself from that inevitable reality is to embrace your inner nerd.